There’s a common misconception that independent bookstores are going out of business due to chains like Barnes & Noble and the invention of kindles. Well, print is not dead yet, my friends. The truth is that independent bookstores are making a comeback. In fact, two new bookstores opened up on Third Avenue in Sturgeon Bay this summer: OtherWorlds Books & More and Novel Bay Booksellers. They’re located almost right across the road from one another. 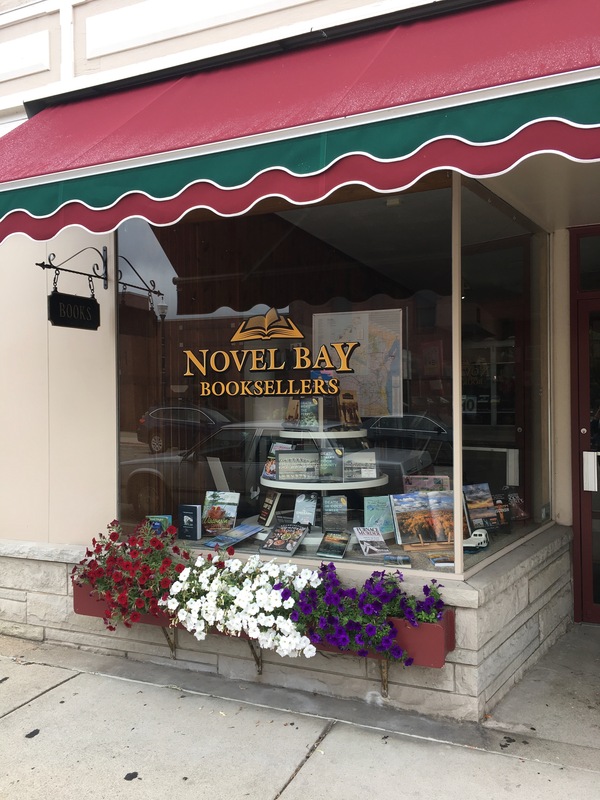 Husband-and-wife duo Liz Welter and John Maggitti, owners of Novel Bay Booksellers, moved to the county officially around last November. Welter made the move when she got an opportunity to work as a reporter at the Door County Advocate, so she came here first while Maggitti stayed back in Marshfield, Wis., as president and junior partner at Customodal Inc. He was travelling the three-plus hours back and forth to spend time with his wife for some 54 odd weekends in a row, he said. They eventually made the decision that Door County was the place they wanted to retire, so Maggitti took leave of his position and also moved to Door County. Then they decided to open a bookstore. Both of them love to read. Books lay all over their house – they used to have a collection close to the size of the amount of books in their shop. When they saw the location of the store, it seemed like the situation just presented itself to them. Neither of them have done retail or worked at a bookstore before, so a lot of research was necessary to get the store off the ground. And speaking of groundwork, they put in new flooring and built new cabinets. There were lots of little things too, like getting a business license and internet, etc. Still, the store transformed organically in the five weeks it took to really turn it into something, Maggitti said. During those weeks they enlisted the help of Baker & Taylor, a well-known book distributor, to help choose what books to put on their shelves. They went through lists of thousands of book titles for that first order, and still work on scrolling through titles every day to keep their shelves current. To start, they knew they wanted to have books from the New York Times Best Sellers list as well as the 100 books from PBS’ “The Great American Read.” They’ve also made an effort to house children’s and young adult (YA) sections, as well as fiction/nonfiction and books from local authors. Welter did most of the work picking the children’s and YA books. She’s a grandmother herself, so she found inspiration from what she had her children and grandchildren read. They wanted to bring that personal connection to the store, Magittii said. A community involvement was important for them, too. For the YA section, they proposed that kids from the community can recommend some of their favorite books and get a free book in return. There’s currently a shelf dedicated to their first curated YA list. Additionally, they’ve made it a priority to be good neighbors to the other businesses on Third Avenue. Novel Bay has felt welcomed – they’ve been offered advice and have started some collaborations. For example, Novel Bay serves Kick Coffee, and gives the coffee shop newspapers in return. Similarily, Novel Bay bought children’s toys from the Dancing Bear, and if parents ask where they came from, Maggitti directs them to the toy store. They also have prints from AMO Gallery hanging up. The business atmosphere of Third Avenue is collaborative, very much a we’re-all-in-this-together type of mentality, Maggitti said. Competition is not at all part of the equation. 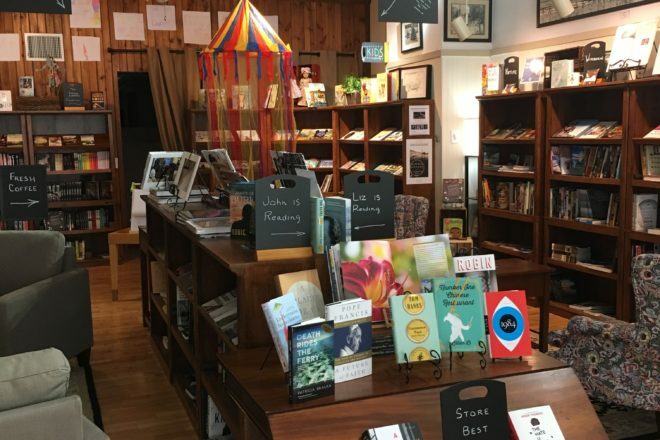 In terms of running an independent bookstore nowadays, Maggitti has found that people often come in with some sort of joyous exclamation that they still exist. People love them, he said – it’s about the shared experience of reading. Sure, stores like Younkers and Book World have gone out of business in Sturgeon Bay, but Maggitti offered an interesting point – stores like that didn’t die here. They died along the corporate chain. In the end, Welter and Maggitti hope to provide a warm and inviting experience for their visitors in an already vibrant community. They feel that a bookstore is really a way to give back to Sturgeon Bay, a city that’s provided them with this unique opportunity, and their new home. 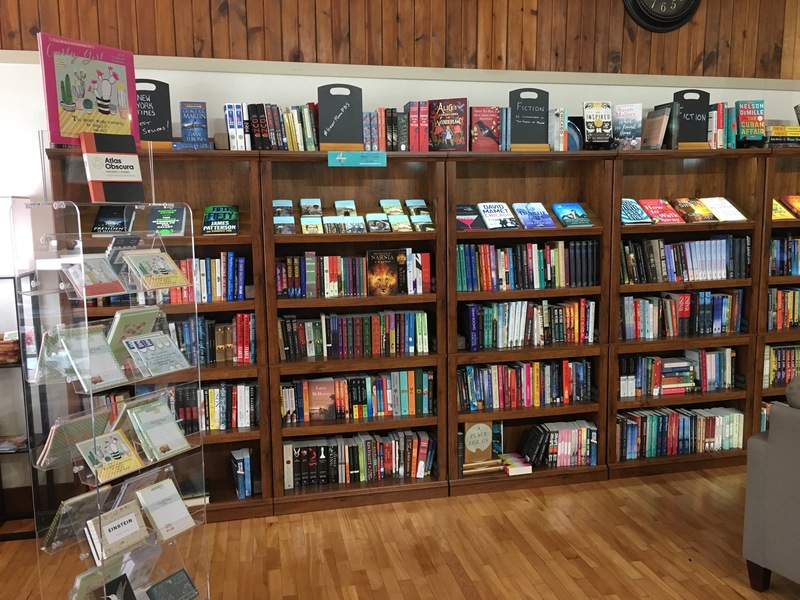 If you’re looking for the two new bookstores in Sturgeon, Novel Bay Booksellers is located at 44 N. Third Ave. and OtherWorlds Books & More is located in the Park Place Mall at 41 N. Third Ave.